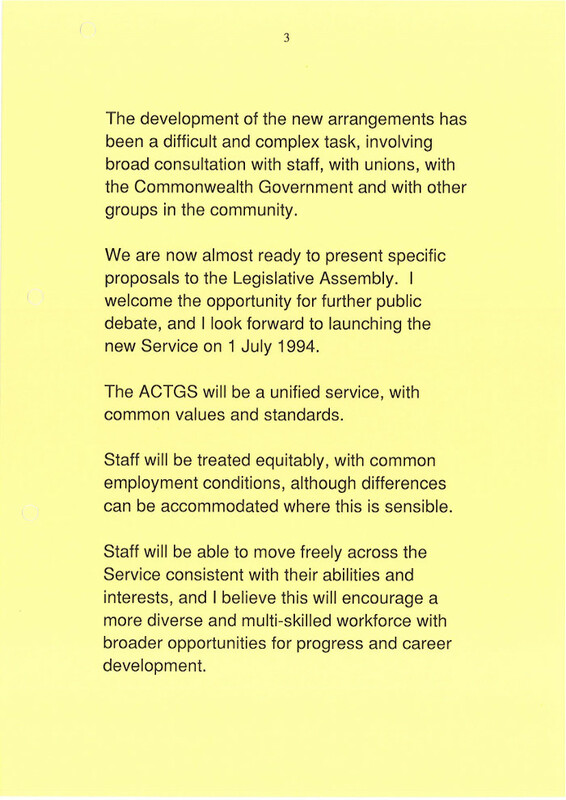 "A Unified Service, with Common Values and Standards"
Did you know that, after self-government began in 1989, it was another five years before the ACT Public Service was established? 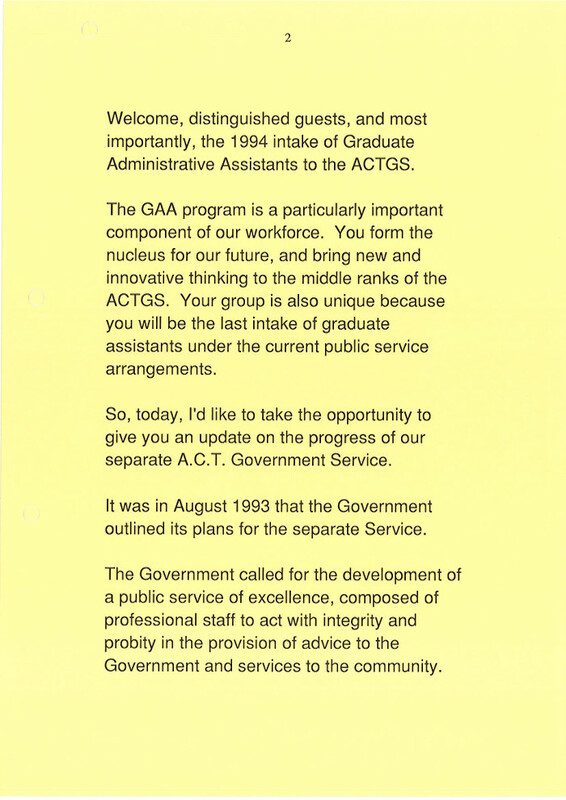 While the ACT Administration within the Commonwealth Department of Territories managed most ACT government matters from about 1985, that work was done by Commonwealth public servants until the Public Sector Management Act was passed in 1994. One file documenting the process, '93/21625 – Separate Service Taskforce – Establishment of the ACT Government Service', is this month's ArchivesACT Find of the Month. Achieving a separate service was a serious and protracted business. A Separate Service Taskforce was established in 1992 within the Chief Minister's Department to plan for the establishment of an ACT Government Service, and the Legislative Assembly formed a Committee in 1993 to review the Public Sector Management Bill and look further at plans for a separate establishment. On 1 July 1994 the ACT Public Service commenced as a legal entity. It required reciprocal legislation to be passed by both the Commonwealth and the ACT parliaments, and the event was commemorated with mementos such as a souvenir spoon, pen, tie-clip and badge, all featuring a logo of the floral emblem of the ACT, the Royal Bluebell, and the words 'ACT Government Service'. Souvenir spoon, pens, tie-clip and badge to commemorate the new ACT Government Service. 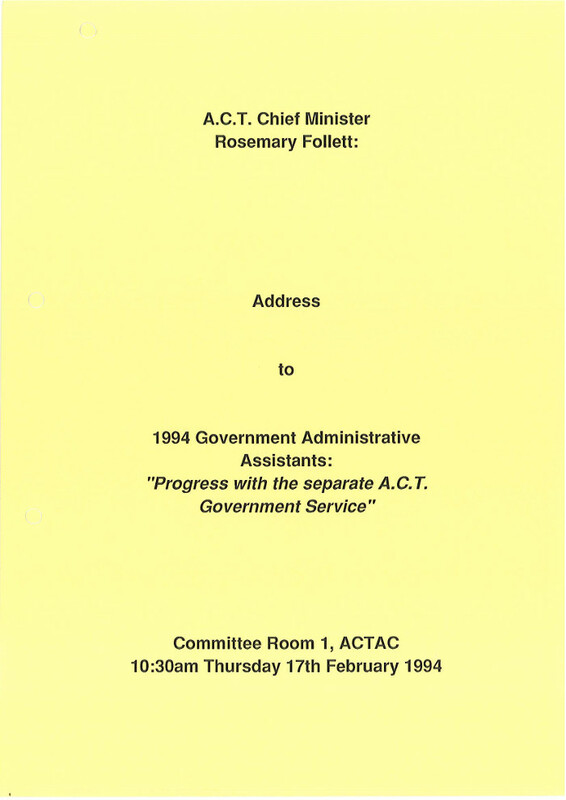 Chief Minister Rosemary Follett addressed the 1994 intake of ACT Graduate Administrative Assistants, who were to be the last to be recruited as Commonwealth employees. In her speech she outlined the practical considerations in creating a government service separate from the Commonwealth, as well as her vision for the new ACT service. She foresaw "a public service of excellence, composed of professional staff to act with integrity and probity in the provision of advice to the Government and services to the community". It would be "a unified service, with common values and standards". A HTML transcript of the full address can be found here: "Progress with the separate A.C.T. Government Service"
Twenty years on, many would argue that the ACTPS has achieved an identity and vision of its own, separate indeed from the Commonwealth. We wonder where that graduate intake of 1994 is now, and what steps they have seen on the road to the vision Ms Follett presented so early in their careers. Commemorative ACT Government Service coffee mugs.